Runners up spot some six months ago when the tournament was held in Ahmedabad, Fan Zhendong won the Men’s Singles title at the Lion 31st ITTF-ATTU Asian Cup Yokohama 2018 on Sunday 8th April; thus he avenged the defeat in the India city when he had lost to Chinese national team colleague, Lin Gaoyuan. In Yokohama he extracted revenge in style; he emerged successful in four straight games (11-3, 15-13, 11-8, 13-11) to win the event for the first time in his career. In addition to last year, he had been the runner up in 2014 in Wuhan and the following year in Jaipur. 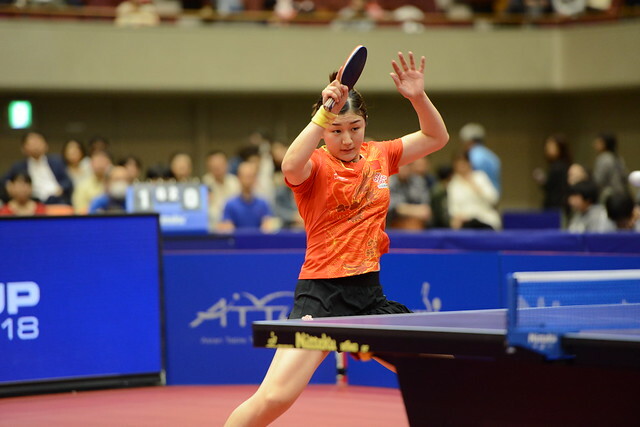 Somewhat conversely in the Women’s Singles event, it was the same name that once again stood on the top step of the podium; China’s Zhu Yuling retained her title. She beat colleague Chen Meng (12-10, 12-10, 10-12, 11-3, 11-4) to repeat the success of one year ago and thus gained a podium finish for the third time, in 2015 in Jaipur she had finished in third place. Meanwhile, in the contests for third place and thus a guaranteed invite to the respective Liebherr Men’s World Cup and Women’s World Cup tournaments to be staged later in the year, it was the bronze medal for Korea’s Lee Sangsu and the host nation’s Kasumi Ishikawa. Furthermore, for both it was second time in succession, the third step of the podium was their lot last September in the Indian city of Ahmedabad. Additionally, Kasumi Ishikawa had concluded matters in the bronze medal position in Hanoi in 2007 and more recently in 2013 in Hong Kong. In the play-off matches, Lee Sangsu beat colleague Jang Sangeun (11-4, 11-9, 7-11, 11-7, 11-9), Kasumi Ishikawa overcame Chinese Taipei’s Cheng I-Ching (11-9, 7-11, 11-4, 9-11, 7-11, 11-7). Further down the order and with distinct possibilities of World Cup invitations, in the Men’s Singles event Tomokazu Harimoto beat colleague beat Koki Niwa (11-9, 10-12, 11-6, 11-5, 10-12, 6-11, 12-10) to reserve fifth place, Wong Chun Ting defeated Nima Alamian (11-7, 11-13, 9-11, 6-11, 11-5, 11-2, 11-8) to secure the seventh spot. Similarly, in the Women’s Singles competition, Japan’s Miu Hirano accounted for Hong Kong’s Doo Hoi Kem (9-11, 11-4, 11-6, 8-11, 12-10, 11-9) to reserve fifth position thus reversing the result of the previous day when she had lost to Doo Hoi Kem (6-11, 11-8, 9-11, 12-10, 13-11). Fifth position for Miu Hirano, it was seventh spot for Chinese Taipei’s Chen Szu-Yu; in the play-off contest, she overcame Korea’s Suh Hyowon (11-5, 11-6, 7-11, 4-11, 12-10, 12-10).